This a recipe I’ve had so long (pre 1990’s – pre The Boy) that I have no idea where it comes from. Well, that’s not exactly true – it was in the Jacksonville Times Union (Times-Onion if you want to be funny), but I have googled it and nothing comes up. Is that strange or cool? I’m going for cool. Not sure who Thomas is, but in my opinion, he’s a rock star. It sounds simple and it is. You can mess about with it and use different cheeses or add Italian parsley which would probably be good, but I kind of stick with the original. I think the key is baking the bread with the garlic, onion, and bleu cheese dressing first. The onions and garlic soften and the bleu cheese bits start to melt. And I said it’s recommended to use Marie’s (I was trying to be nice, but …) , but it must be Marie’s Super Blue Cheese dressing (in the produce section). Get it when it is buy one – get one and it lasts pretty much, for months, in the fridge. This is key – if you ask me. OR make your own chunky bleu cheese dressing – that would work for sure. 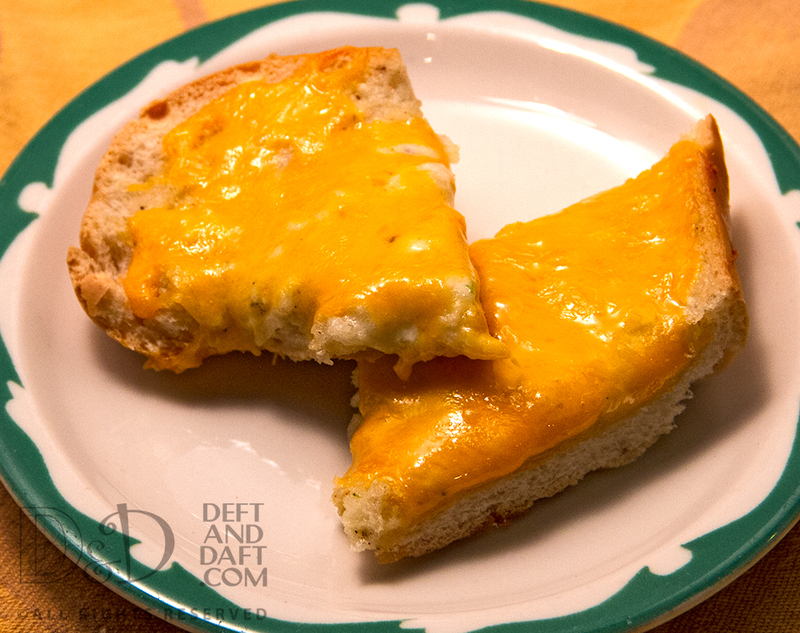 May have to try that next time and see if The Boy notices, as he a conniseur of this lovely garlic cheese bread. Preheat oven to 350 degrees. Slice French bread in half horizontally. Combine onion and garlic in small bowl. Mix in bleu cheese dressing. Spread mixture on both sides of bread and close bread and wrap in foil. Bake in oven for 15 minutes. Remove from oven and open bread to lay flat on the foil. Top with cheddar and return to the oven until the cheese melts. If desired, put under broiler for a few minutes until crunchy. Remove from oven. Slice with serrated knife.